*Please note, this product is currently only available in a 1.2 ton pallet. 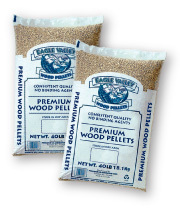 $370.80credit price, or save $9 per ton and pay $370.00cash/check (plus delivery)! Delivery in Connecticut starting at 1 pallet of Pellets. We charge $60.00 to deliver the first ton and $15.00 per additional pallet on same delivery. Outside of CT, please call us for delivery price.